Hunting Big Rams is what we Love to do! 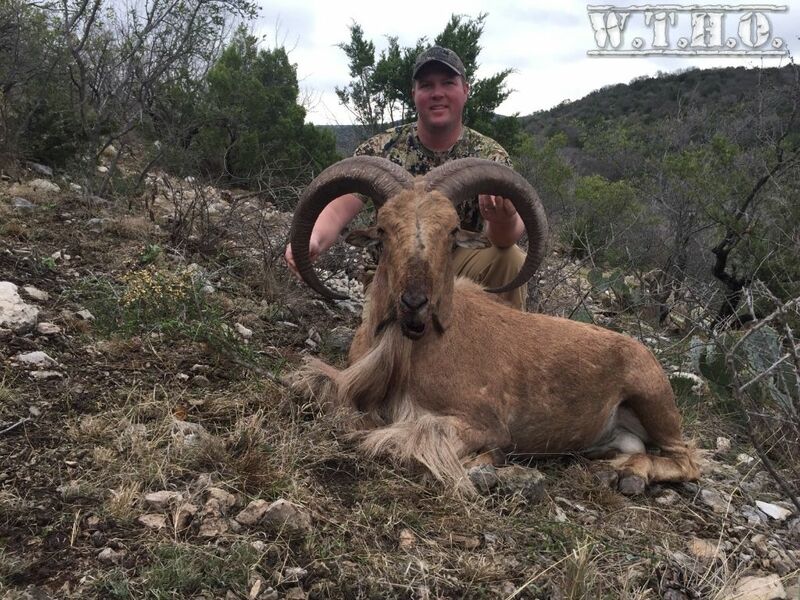 Trophy Aoudad hunts are conducted in the rugged mountains of far west Texas where the best genetics for Big Rams are and started in Texas. We also offer hunts on several ranches in Val Verde county in very limited numbers where there are also high Trophy Quality Ram genetics. We are very specific in the properties we choose to offer Aoudad hunts on and we strive for only the best so you the client can have a memorable hunting experience. Hunts are priced according to the size of the property, accommodations, trophy quality, and availability. Please keep in mind each property has produced rams upwards of 35"+ consistently each year. Guided Aoudad hunts to date have offered a 97% +/- shot opportunity and 95%+ harvest success, self guided hunts 75%+ harvest success. On your hunt we are after a ram in the 30" plus range and will give it our all to only harvest Trophy Rams of this caliber or close to it. Average Trophy rams are in the 28" to 33" bracket. Most hunts will be 3 days and during the Aoudad Rut which is late September through early November or in winter time (January through early March) and you will most likely be sharing camp with another hunter or two. Group discounts are available and we welcome up to 4 (possibly 5) hunters at a time on any of our properties if there is availability. A solid penetrating bullet and flat shooting rifle (minimum of .270 or similar) is a must on these hunts and a good pair of binoculars in the 10X or 12X range. If you have a spotting scope bring it along, we will be glassing out to past 1 mile to locate trophy rams on the move to put a stalk on one. Hunters must be in good physical shape for these hunts, if you are not arrangements can be made to hunt safari style or over feed and or water if available. You need to be prepared to accurately shoot upwards of 400+ yards (not always the case) on these hunts and if you are afraid of heights let me know prior to booking. A good day pack to hold plenty of water and snacks is a must along with medium to hard soled boots well broken in with good tread left. Shin guards are also a good idea for the "no see um" cactus. to ensure a date that fits your schedule. We hunt our free range Trophy Aoudad from late September through early March with some Devils River (Val Verde) properties available year round. You are hunting in the desert, expect warm days and cool nights even during winter months. Non residents will need to purchase a Type 157 5 Day Special non resident license which is $48.00 over the counter. Residents will need to purchase a Type 101 license which is $25.00 over the counter. 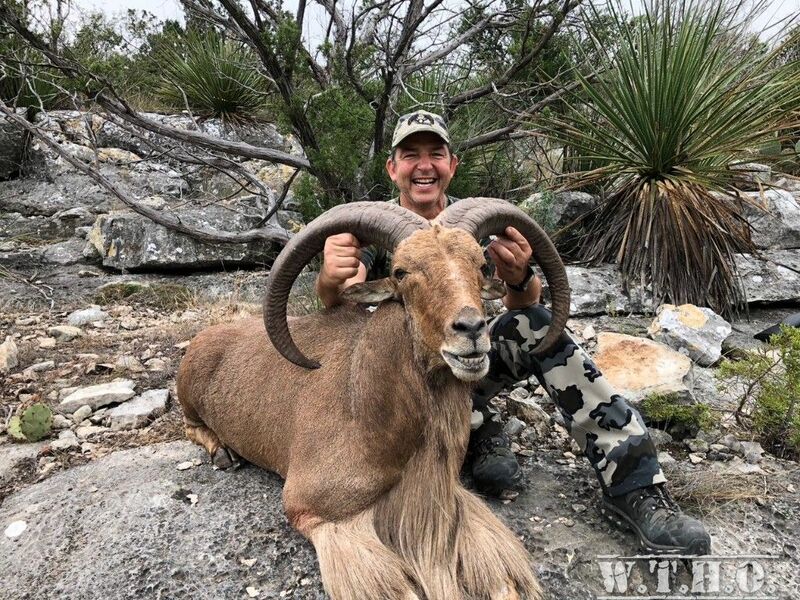 If you are brave enough to try an Aoudad hunt with your bow I would recommend a hunt in the Val Verde county area first, We welcome you out to give it a try. Aoudad hunting is very addicting! road systems and feeders on some properties to hunt Safari style or out of Blinds. All Other Properties are in far West Texas, rugged, and physically challenging in most cases. nearby location for an additional fee. Physically challenging hunt in a high trophy quality area. Only a handful of Rut hunts and winter hunts are available. There is a possibility of Elk being seen on your hunt which can be added on as a Trophy Fee. more information on this newer property. Now Booking for Fall 2019 and Later! Ranch #1 Booked through Fall 2019, Now Booking for Early 2020 and later. Ranch # 2 Booked through Fall 2020, Now Booking for Early 2021 and later. lodging but no food. 1 Guide onsite to assist hunters. Meals and Onsite or nearby lodging will be provided on guided hunts. are best suited to hunt 1 to 4 hunters maximum. Guided Hunt will Include Hotel Lodging & Meals. No amenities onsite, remote location. 3 Day Hunt with a Guide to Point you in the right direction. Minimum of 2 Hunters. Lodging included, you bring your own food and vehicle(s). 1x1 & 2x1 Meals and Lodging provided. Booked through Early 2020. Now Booking for Fall 2020 and later. physically challenging hunt with a chance at a Red Sheep on a trophy fee basis. for 1x1 or 2x1 guided hunters with meals. welcome to create a group. Meals and Simple Lodging provided on guided hunts. 3 Day Hunt with a Guide to Point you in the right direction. 3 to 4 hunters. Lodging included, your bring your own food and vehicle(s). 13,000 acre ranch near Sonora Texas. Good road system , canyon country. Bag Limit: 1 Aoudad Ram, 1 Javelina & Unlimited Predators. self guided hunters. Similar to Van Horn Ranch as far as terrain and quality of hunt. Very near to the Van Horn Ranch as well. Best hunted with 1 to 3 hunters. Booked through Early 2021. Now Booking for Fall 2021 and later. throughout ranch allowing for safari style hunting out of UTV's and ranch vehicles. provided and meals, private rooms available. Best hunted with 1 to 3 hunters. Mule deer hunts also available on this property.